The recap for the first week of Maimi’s bicycle trip segment can be read here. For the second week a row, “HaroPuro! TIME” followed Maimi on her bicycle trip from Tokyo to Shizuoka to pray for the success of ℃-ute’s upcoming single, “Kimi wa Jitensha Watashi wa Densha de Kitaku” (You Ride Your Bicycle While I Catch the Train Home). The week’s segment began with Maimi setting off on her journey in front of Tokyo Tower. Since it was her first bicycle trip, she was anxious about things like whether or not she’ll be able to follow her route properly and where it’s okay for her to ride her bicycle. After stopping to wait for a green light, Maimi reminded herself to be on the lookout for cars as she stopped to let one turn in front of her. A short while later, Maimi arrived in Roppongi, approximately 1km (0.6 miles) from where she started. She stopped to consult her map on where she needs to turn, but she had trouble understanding it. Maimi stopped again a little further ahead and wondered if she was lost, before moving her bicycle somewhere out of the way to check her map again. Maimi decided to head straight ahead for the time being, and then arrived in Shinjuku ward. As Maimi stopped to check her map again at the intersection, the announcer said Maimi is losing time because of her hesitation. She then finally arrived in Shinjuku city, where she commented that there’s a lot of people and she’s embarassed because of the outfit she’s wearing. The segment wrapped up with the announcer noting that Maimi arrived in Shinjuku after 2 hours, at a pace of 3km per hour. 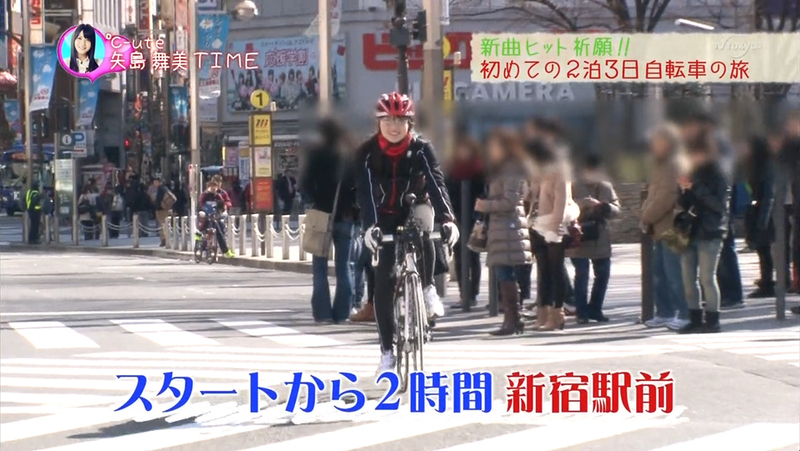 A preview for the 3rd week of segments followed, showing that Maimi will encounter some trouble with her bicycle on the trip. In addition, Maimi also made an appearance during fellow ℃-ute member Nacky’s (Nakajima Saki) segment this week, where Nacky chronicled the filming of the music video for “Kimi wa Jitensha Watashi wa Densha de Kitaku”. When Nacky asked Maimi about the filming, Maimi explained that they’re recording the fast lip scene version, where they lip-sync to a fast version of the song which will then be slowed down. 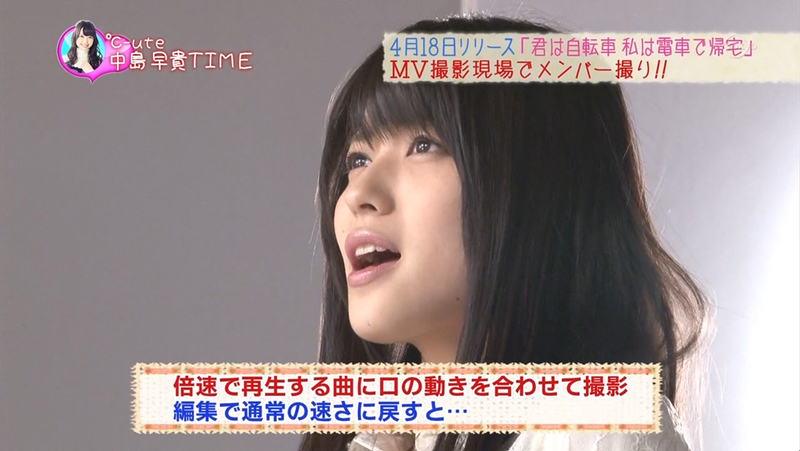 Posted on April 1, 2012, in Recaps and tagged Yajima Maimi. Bookmark the permalink. 6 Comments. Unfortunately, I couldn’t find a YouTube link for this one. For the purpose of getting screencaps I usually get the torrent of the episode off Hello!Online’s tracker, so you can find it there if you’re willing to download the whole episode.